Mornin' folks! How about another Mama Elephant stamp highlight? Today, the DT is highlighting the background/border stamp set, On Point Borders. This set has 5 different graphic border stamps perfect for adding a subtle texture to your projects. I took the largest stamp of the bunch and stamped it in white on kraft. I *love* how it turned out. Nice detail without being overwhelming. Then I took the Stitched Frame die (from Femme Frames) and made a custom panel by cutting the panel once and then cutting it again across one of the corners. I highly recommend double cutting or mixing and matching dies. You can get so many looks just from a handful of dies. As you can see, I needed to cut off one corner so that I could pop in the little dinosaur from Just Hatched. 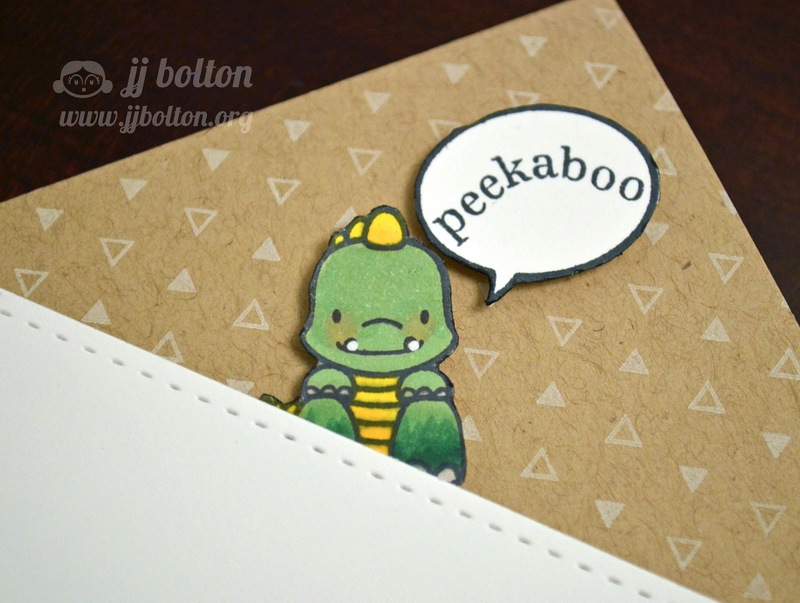 The "peekaboo" sentiment was a little long for the speech bubble, so I curved it to make it fit. Before I finish, let's take a closer look at that adorable baby dino! Thanks for stopping in today! Come back tomorrow for one more stamp highlight and today go check out what the rest of the DT has in store for this fabulous set! Oh, My...This is too cute!!! Love! This is AWSOME!!! LOVE it!!!! Love the pocket! And that dino baby is my fav! So cute!! Oh, this is just too CUTE! I love how you created your pocket and your 'On Point Border' stamping is fabulous in white on Kraft! Such a fun card!